Everyone gets excited when they see or hear about a big local sports event. These big events are fun to both watch and participate in and from registration to wrap up they seem to magically go smoothly and you never really think about how it all happens. You know? You think about the fun, or the competition of the event and logistics maybe never even cross your mind. Well let me tell you this, sports tournaments are pretty much all logistics. Planning and logistics of every kind from start to finish. That much needed cup of ice water sitting at the end of your race? Someone set all that up. The free T-shirt you got for running? Someone ordered your size and put it in your registration bag. When you went to see your score, someone entered that in, as well as 500 others. There are countless other examples and it&apos;s just part of what goes in to a successful athletic tournament of any kind. Who is it behind the scenes that make an event go smoothly? Well, sure, of course, the Greater Lansing Sports Authority is there. The GLSA grows small local sports tournaments and events into bigger ones and we also go after tournaments of all kinds looking for a host city, and bring them to the Capital City. If you&apos;re a player in the local sports community you already know that. What you may not know however is another key, absolutely critical, element to a successful sports event is the very very valuable volunteers. These helping hands do so much, in fact, no good sporting event could occur without them. How would you like to be a part of something big? Would you like to be a part of what makes a sports event a huge success? Do you want to help the community and hundreds of people at the same time? You do?! Excellent, because literally all year long the GLSA has incredible volunteer opportunities at sports events of all kinds. We need volunteers for baseball, softball, tennis, road races, basketball, March Magic Hoopfest, Hawk Island Triathlon, the Capital City River Run, bowling events, hockey, figure skating and the list goes on and on. Getting involved as a volunteer is such a smart move because its a classic win-win. You get the special feeling that comes along with helping others and local involvement and we get to keep hosting incredible sports tournaments that help the local community be fit, fun and economically strong. 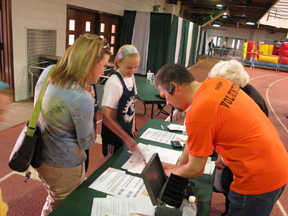 For all kinds of information about volunteering with the Greater Lansing Sports Authority go to the BE A VOLUNTEER page of lansingsports.org, or send your specific question through the CONTACT US section. We look forward to working with you soon - the future of amateur athletic contests in Greater Lansing may depend on it!